Terrariums are hot right now. They can sit on a desk, ledge or windowsill and bring a little green into a small space. They are also hot as a personal accessory. 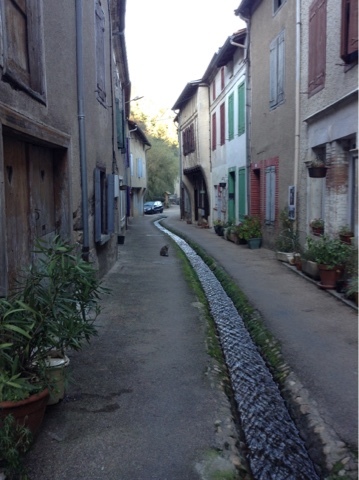 When I was in France at La Cascade in Durfort this past Fall, I gathered some local stone and moss from the cascade (waterfall) outside my bedroom window and from the copper workers' gutter that runs down the middle of the street in front of the house. 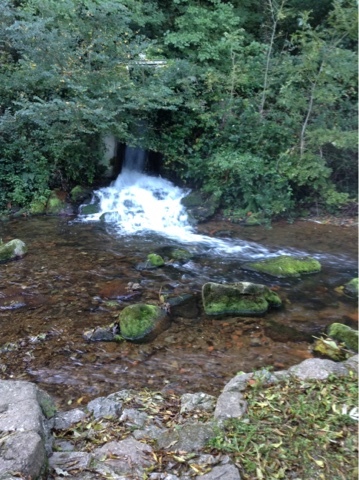 Yes I waded out to the boulders there to pluck some moss. I found a tiny chunk of driftwood in the stream, and a small rock on the patio, then it occurred to me that I could arrange these tiny and fragile souvenirs under glass and create a wearable keepsake from my once-in-a-lifetime trip. To make the piece even more reflective of the workshops we experienced, I added a poured metal birdie (a feather I found was just too big to fit) since we learned about melting and pouring low-temp metals into molds, and sealed the piece with silver Ceralun Clay and a constellation of Swarovski crystals. Right now, the piece is still awaiting integration into a piece of jewellery. I had originally contemplated turning it into a ring but I've had no luck finding the right shank to mount it on. Lately I've been thinking more about how I can use the Now That's a Jig! and steel wire to cage this mini terrarium and turn it into a necklace. So I started researching terrarium jewellery on the Internet and have seen many delightful works posted on etsy and Pinterest. Lots of inspiration to be had. 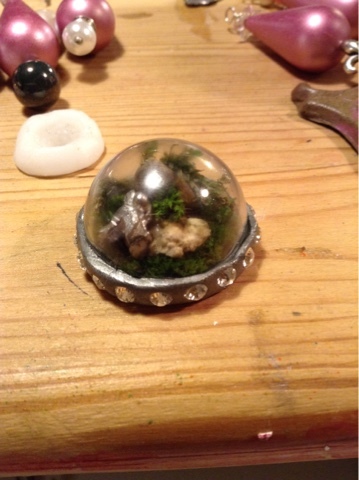 There are several tutorials online explaining how to create terrarium jewellery. Check them out and share your results if you'd like. So this summer, whether you're at the beach, hiking or just hanging at the local park, keep your eyes and imagination on your surroundings. You will be amazed and excited by the "walksom" (a term my friend Brenda Schweder coined for the whimsical pieces she collects on her daily walk) you find and can turn into very organic and personal keepsake jewellery.